Mission accomplished. Matt Serra disciple Chris Weidman (Pictured) dominated highly decorated wrestler Mark Munoz to stake his claim at Anderson Silva’s middleweight crown. Immediately following the biggest win of his career, Weidman used his mic time to call out the world’s top 185-pouder. “I want Anderson Silva,” Weidman stated. Following his ninth victory in as many outings, including Wednesday’s outstanding performance at ‘UFC on Fuel TV 4,’ not many can argue against his possible top contender status. Weidman made it clear, however, that if UFC president Dana White were to give him a crack at the title, he’d like a full training camp to prepare for arguably the planet’s top pound-for-pound fighter. 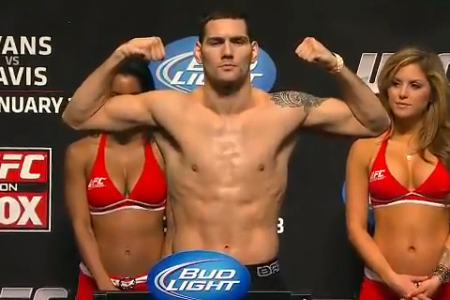 “Every time I’ve had a full training camp, I’ve gotten a finish every single time,” Weidman stated. “Give me a full training camp against Anderson Silva and I’m pretty confident I’m gonna not just go in there and get the W, but get a finish over one of the best fighters of all-time. Don’t worry Chris, your wish may be granted.